Here at this page on this date i am going to showcase a current awesome news from ENI Pakistan Jobs 2016 Training Opportunities NTS Online Registration. 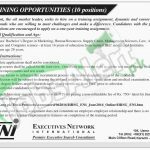 The Executive Network International is the well reputed oil and gas company is recently announced the training programs for the 10 positions is looking to appoint and invite the dynamic, energetic self-motivated and diligent applicants to come forwards and apply to get enroll in this straining program. The duration of this training is one year and after its completion it will not be subjected to the employee -relationship further and there is no any obligation to raise the voice against it permanent basis and to provide its employees relationship. So guys, its the wonderful opportunity in this sector for those applicants who are keen interested in such sectors must go through this training and get huge expertise and experience which will be counted as beneficial points. The Foreign degree holders can apply by submitting the HEC certificate and the applicants who will score the top in the test will be intimated for interview. So, after discussing now let's have look on its educational and applying process. Educational Requirements: For all those applicants who are willing enroll themselves they need to had the education of Bachelor's degree in Marketing, Human Resource, Supply Chain, Management Sciences, Law, Accounting, Finance and computer Science at least 16 years education is required from HEC recognized institutes. Age Limit: Maximum age of the applicant should be 28 years. The applicants can apply by visiting the NTS website www.nts.org.pk for online registration or can get access of application form from the given web link below. The applicants have to pay the test fee of Rs.750/ which is non-refundable and non-transferable. Duly filled applications should be submitted with deposit slip to the NTS Headquarter. Last date for applying is 27th July 2016. The top score holders will be called for interview. Final selection of the applicants will be done on the basic of clearing the written test and interview and medical examination along with degree verification. So for more quality jobs from all sector let's have a look and keep visiting this page for future jobs all the time.